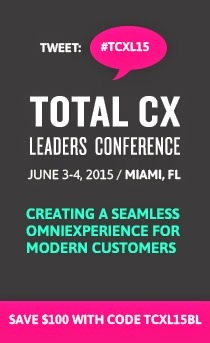 Earn a complimentary all-access pass to Total Customer Experience Leaders Summit 2014 by serving as a Guest Blogger at the event. As a Guest Blogger, you’ll have access to TCEL’s comprehensive agenda attracting the best in customer experience insights from around the world, right in Miami in April. You'll get a pass to the annual TCEL event plus exclusive access to a networking community and on-demand webinars, to help you grow and learn throughout the entire year. Guest Blogger responsibilities will include submitting at least one post per week to the Customers 1st blog between now and the conference and attending specifically assigned sessions at the event and blogging live or same day. Apply today by sending your name, title, company, short biography and links to your blog or writing samples, along with a few sentences about why we should choose you to be our 2014 Guest Blogger to Amanda Ciccatelli at aciccatelli@iirusa.com. We will review your submission and contact the chosen Guest Bloggers directly with more details.